Starting a new festival is risky business. How do you go about building something new? How do you draw people in? And how do you prove it's popular enough to become an annual event? The first step, of course, is to have a good idea. 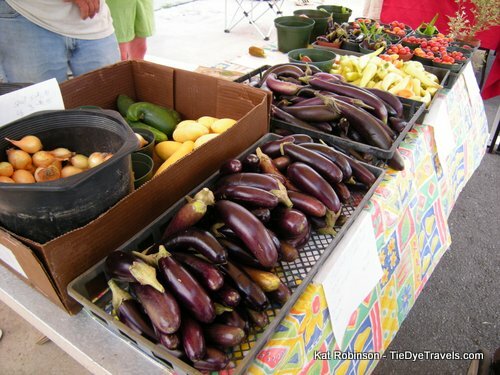 You don't want to have an eggplant festival if the town in the next country also has one -- it's not unique. You want a theme, an idea that can draw in a crowd and entertain. North Little Rock's Argenta District just might have struck it right. The redeveloped district is growing, drawing in young professionals and folks of all ages seeking an upscale downtown lifestyle. The Argenta Foodie Festival fits right into all of that. Of course, there's also a matter of venue. And for this first time out, that venue was... a parking lot. A parking lot next to another parking lot, but not just another parking lot -- the lot where the Certified Arkansas Farmers Market gathers each week. Across the street from the soon to open Argenta Market. Such a location... located within easy walking distance of plentiful parking and just blocks from many of the hot new restaurants in the district, is just full of win. I ventured out with my youngest traveling companion to check out the first ever Argenta Foodie Festival this past Saturday. We arrived around 10am on this particular Independence Day, and were quite happy to find that the heat had not yet blossomed and the sun was still obscured by clouds. We found easy parking a half-block off Main Street and set out quickly, following the sound of folk music. The span of the festival bloomed before us at the intersection of 6th and Main. First off, a tour was in order. We wandered to the far end, past the musicians and a large tent set up for diners, to peruse what was being offered. The open lot was patched in sections of concrete and gravel, and was dotted by a line of pop-up tents manned by crews from the 14 participating chefs. One of the first we encountered was a table selling fried apple and peach pies from Chef Richard Lindsey for $2 -- a perfectly reasonable price. 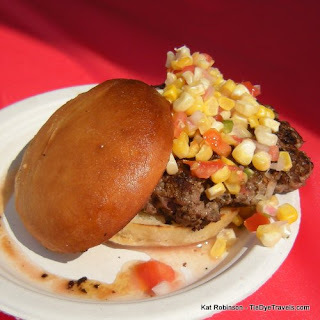 Next door, offerings from The House, a brand new restaurant and bar in Little Rock that's just opened -- in the form of an "Arkansas Beef Slider" -- hand patted beef patties on soft rolls with Arkansas Corn Relish. And more offerings followed -- such as Peach Ginger Smoothies from Cregeen's Irish Pub, some incredible looking Arkansas boudin made from pork and rice from the Stuttgart area, purplehull peas with ham, and more. 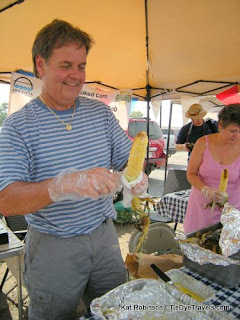 There was a fantastic line of folks for roasted corn on the cob ($2 an ear or two ears for $3). And right next to the corn folks -- somewhat strangely -- was a full service sushi bar. 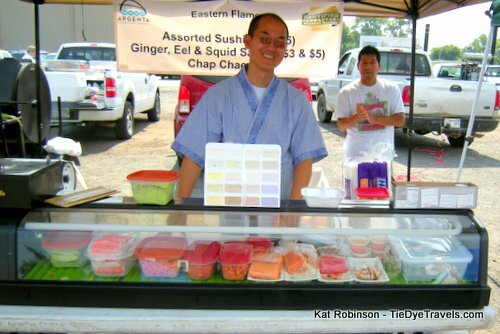 That's right, the folks from Eastern Flames had brought a mobile sushi bar to make up fresh rice-clad delights. They were even offering free samples of luminous sobe noodles, savory and light. There was more -- lovely spring rolls from Lilly's DimSum Then Some, Arkansas grown Fried Green Tomatoes, and Arkansas Fruit Sorbet from Starving Artist Cafe. The Trail's End BBQ Catering Company had set up a Texas-Style barbecue table with beef brisket and beef ribs, which delighted me to no end. Simply the Best Catering had rice horschata and shortcakes, and Petit Jean had a whole booth full of sausages, bacon, and ham. 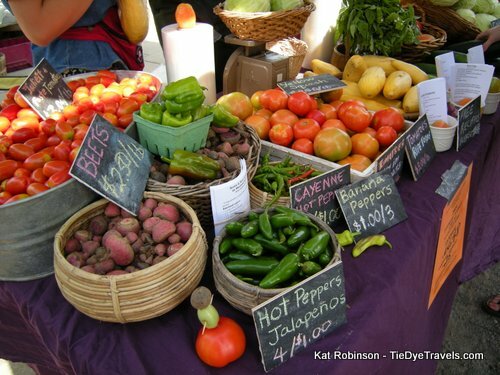 We decided to do like many others were doing, and walk across the street to the Certified Arkansas Farmers Market. It's a picky market, sure. 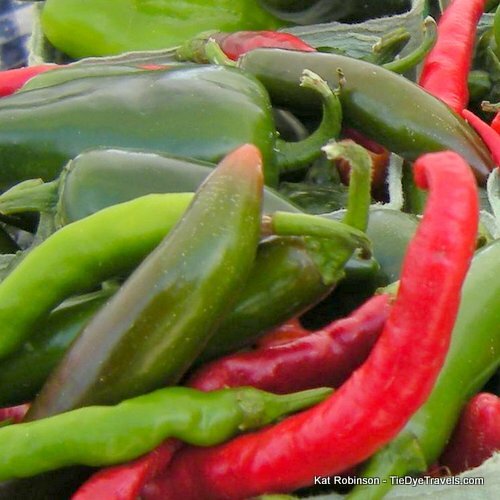 Every vendor allowed to set up has to be certified as an Arkansas producer or farmer. That means all the stuff you can find there, comes from here. Excellent. It's just the beginning of the state's best harvest -- when the first batch of ready ripe tomatoes appear, the zucchini and squash start flooding the market, peppers are green and just beginning their journey to redness, peas are ready and the first watermelons are small but juicy. 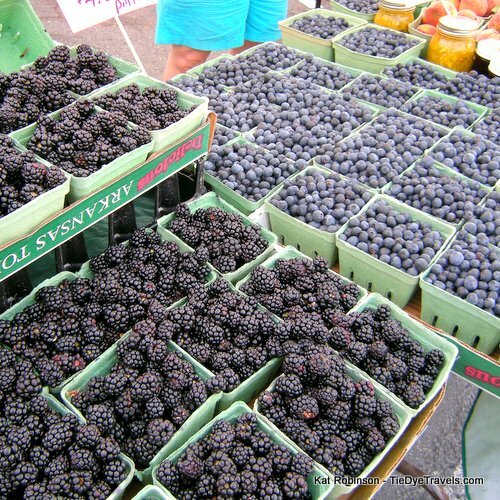 And the blackberries and blueberries are prime... that small window between just ripe and overripe so small, so short. Eggplants are still small, and potatoes are rampant, and it's all right there. Also to be found at the market -- fresh meat. A couple of vendors were selling fresh-quick-frozen beef cuts and whole frozen pasture-raised ducks. 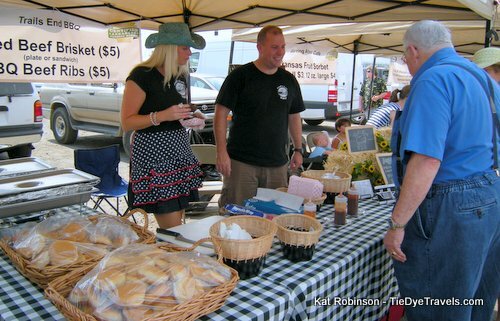 Honeysuckle Farms had its cheese on display, and the Argenta Market folks were selling preparations of salsas and dips and fresh-made breads. 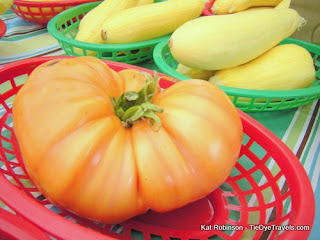 We picked up scallop squash and yellow squash for dinner, and oggled some rather prime looking heirloom tomatoes, before going back over to the Foodie Festival to eat. That's where we tried fried pies and BBQ beef ribs and the like, and enjoyed ourselves rather a lot. 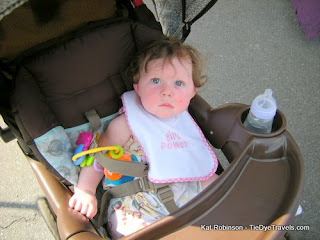 The offering of hand-wipes were pleasantly and gratefully accepted, and except for the difficulty in finding a place at a table that wasn't directly in the sun did quite fine with our early lunch. And the clouds parted, and the heat of the day began to rise, and my young companion's suddenly red-flushed complexion signalled that it was time to find shade and air conditioning. The Argenta Foodie Festival seems to have been a success. We've heard that 600 people came out, which is not a bad showing for a first time festival. If I were to offer any sort of suggestion, it would be to consider a permanent sort of structure for the folks at the CAFM and for the festival... the empty lots wouldn't require a whole lot of work to make that happen, and the cover would be appreciated. Overhead fans could be installed to keep the air flow going. But of course, those are just suggestions. I'm very interested to see how this free festival will grow in the coming years.